Corporate Responsibility Magazine has announced that Microsoft was named among the Top 3 Best Corporate Citizens for 2012. 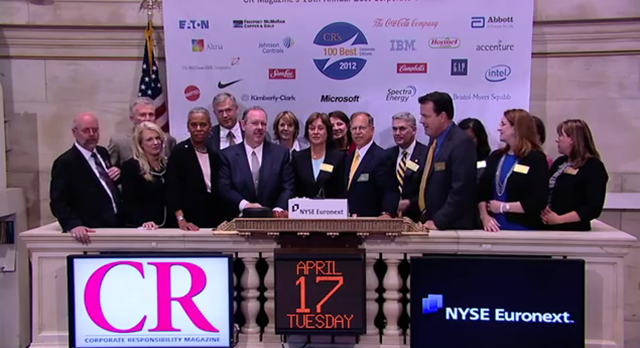 CR Magazine’s 100 Best Corporate Citizens List is known as one of the world’s top corporate responsibility rankings. Now in its thirteenth year, the list ranks companies based on publicly available information in seven categories: environmental impact, climate change, human rights, philanthropy, employee relations, financial performance and governance. It is a considerable honor to have been ranked so highly on this prestigious list alongside other companies that have devoted so much and made such sizable contributions to our society. For Microsoft, Corporate Citizenship is core to our company mission of helping people and organizations around the world realize their full potential. As our company has grown, our commitment has extended far beyond our own products and services and has been amplified many times over through our partner network – including our non-profit partners, with whom we work closely to apply our business skills, our technology, and our company resources to serve the communities where we live and work around the world. Microsoft was founded on the belief that putting technology in the hands of individuals could enrich and improve their lives, and we’ve invested heavily in improving individuals’ access to technology. However, we’ve recently identified a more complex issue that extends beyond technology access and cuts across economic, geographic and social boundaries. This issue is the opportunity divide for youth. Around the world, new skills and experiences are needed for new economies, but the approach to educating and training young people for this new world isn’t keeping apace. While some young people are prospering, those on the other side of the opportunity divide lack the skills, education, experiences, and connections to employment that are required to survive and thrive. According to a recent International Youth Foundation report, “Opportunity for Action,” nearly 75 million young people were unemployed worldwide in 2011. This equates to an unemployment rate of 12.7%, which is more than double the rate for people over the age of 25. And, for those young people who have jobs, it is concerning to note that many are working in poor conditions for very low pay with no safety nets for protection. Indeed, youth today comprise 25% of the world’s working poor. Another alarming fact is that only 44% of youth worldwide have access to a high school education, which is one of the most basic requirements for gainful employment. Addressing the challenges facing youth is critical to the economic future of all countries and regions around the world and Microsoft’s desire to help them create a real impact for a better tomorrow. Therefore, Microsoft is focusing on helping youth cross the opportunity divide by empowering them to imagine and realize their full potential through a number of programs. These programs include empowering nonprofits around the world with cash donations and free software – nearly $1 billion in 2011 alone – to address issues of technology and workforce training, especially among the youth population. They also include working with millions of teachers to build their technology skills and reach students in new ways through innovative practices in their classrooms. And, it they including engaging students directly as well….in this year alone, we helped more than 350,000 students from nearly 200 countries develop technology solutions to address the world’s toughest societal problems through our Microsoft Imagine Cup competition. We’ve even provided a select number of those students with a cash grant to help them bring their ideas to market. These are just a few of our programs to empower youth to change their world. We invite you to learn more about our work in this area and join us in creating opportunities for today’s global youth.